Thursday, July 6, 1837.Springfield, IL. Lincoln writes and files an injunction bond signed by Reuben Radford and George Forquer inTrailor v. Radford. 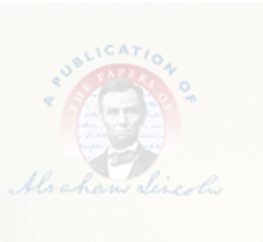 Lincoln writes and files declarations for Abner Y. Ellis, William Herndon, and Aaron Coffman in three attachment cases, Ellis v. Smith, Herndon v. Smith, and Coffman v. Smith. Lincoln files answer as guardian ad litem of the infant heirs of Shadrach J. Campbell, defendants in James Weden v. Campbell et al. Stuart & Lincoln have eight cases called, in one, Webb v. Watson, they obtain a default judgment for their client James G. Webb, and a jury awards $87.75 in damages.Photocopy; Record; Herndon-Weik Collection, Library of Congress, Washington, DC.